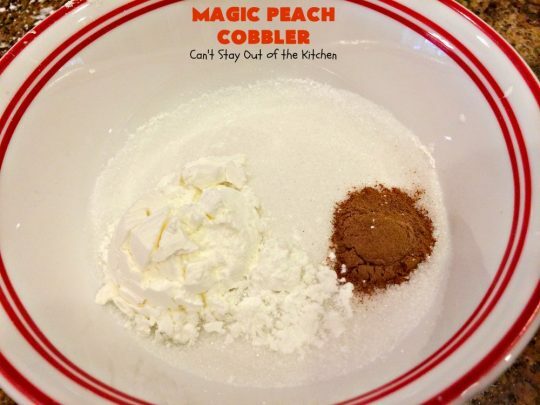 Magic Peach Cobbler sure is magical. No kidding. If we’re talking baseball, this recipe is not merely a home run–it’s a GRAND SLAM! Magical, indeed. The crust topping bakes up so wonderfully that all you want to do is keep eating. Magic Peach Cobbler has peaches on the bottom, then a crust is spooned on top, sprinkled with cinnamon sugar and then boiling water is poured over top before baking. The crust transforms while baking and rises to the top like magic and the flavor is absolutely awesome. 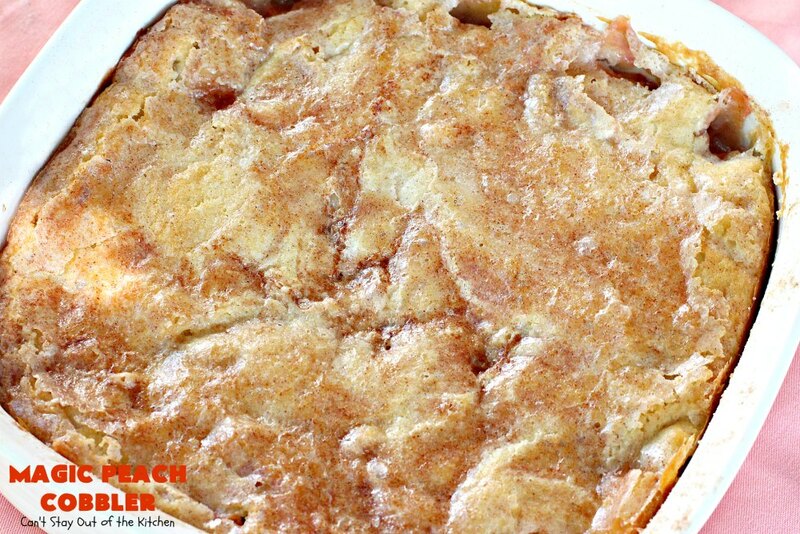 I tried many different Peach Cobbler recipes with our peaches this year including my favorite Double Crust Peach Cobbler, Tennessee Peach Pudding, Peach Cobbler with Praline Filling, Easy Peach Cobbler , Mom’s Peach Cobbler, Gluten Free Peach Surprise and even Paula Deen’s Peach Cobbler. Without exception, all were fantastic, but Magic Peach Cobbler was A-M-A-Z-I-N-G. I loved this stuff and will certainly put it on our menu regularly for Peach Cobblers in the future. I was down to the last few cups of peaches left for baking and I had some friends in our Sunday school class ask me if I would help make some Peach Pies or Peach Cobblers for their daughter’s wedding next summer. Their future son-in-law doesn’t like cake but he loves pie and cobbler, and coming from Georgia, he especially loves Peach Pies and Peach Cobblers. They wanted some samples of my cooking to get an idea of what to ask for. So I sent them a couple of cobblers. 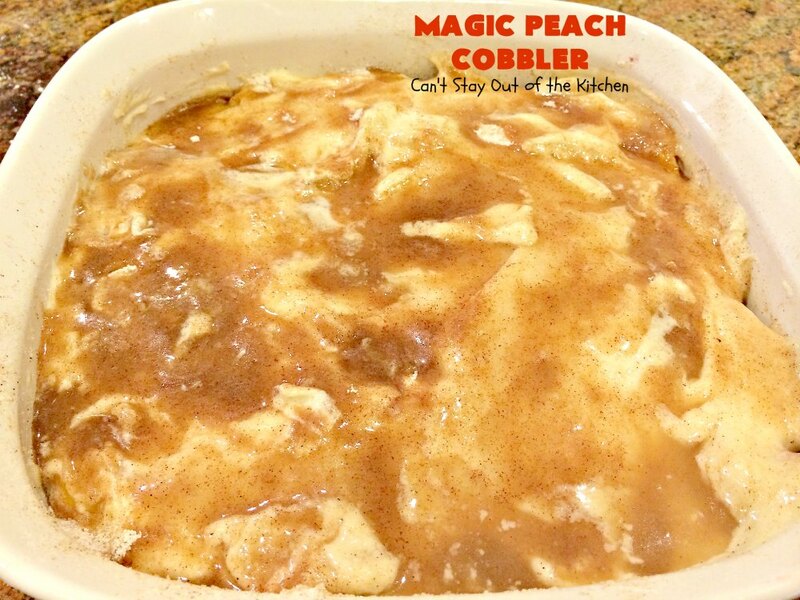 Magic Peach Cobbler was the one they raved about. I agreed with them, it was certainly one of the best cobblers I’ve ever eaten, plus it’s really fairly simple to assemble. 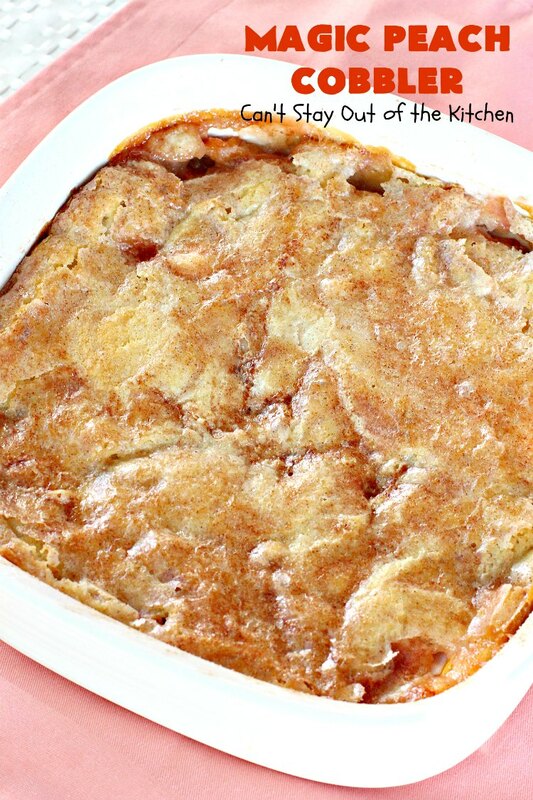 I love my Double Crust Peach Cobbler recipe but it really is a bit more work rolling out two pie crusts – and since I make this in a huge baking dish it’s a lot more effort than Magic Peach Cobbler. If I end up making some cobbler recipes for her daughter’s wedding, I’m pretty sure Magic Peach Cobbler will be on the menu. They want a simple wedding with foods they enjoy and they loved this dessert. Magic Peach Cobbler is pure magic! We loved this cobbler. The crust on Magic Peach Cobbler is what’s magical. You pour hot water over the crust and cinnamon-sugar mixture and it magically blends together into a spectacular topping. Pare and slice peaches. 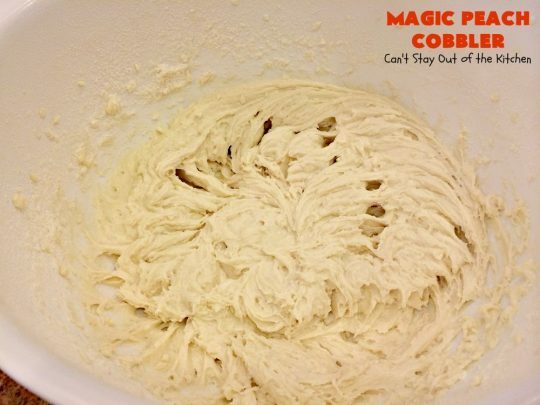 Place in a greased 9×9″ baking dish. In a mixing bowl place softened butter, 3/4 cup sugar and vanilla. 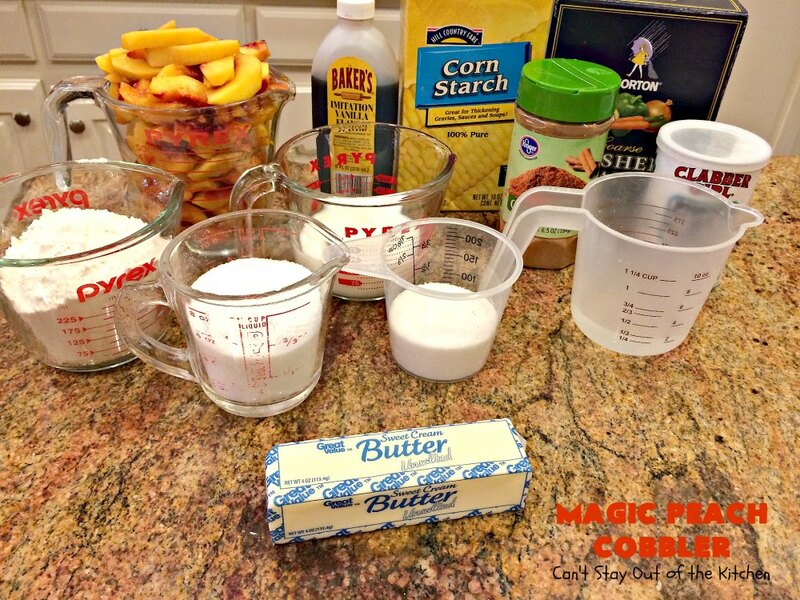 Cream ingredients with an electric mixer until combined. Add UNBLEACHED all-purpose flour. Bleached flour toughens baked goods. Add milk salt and baking powder. Spread topping mixture over top of peaches in baking dish. Combine cinnamon, sugar and cornstarch. Stir to combine. Pour boiling water over top. Make sure all the sugar is covered and no dry spots remain. 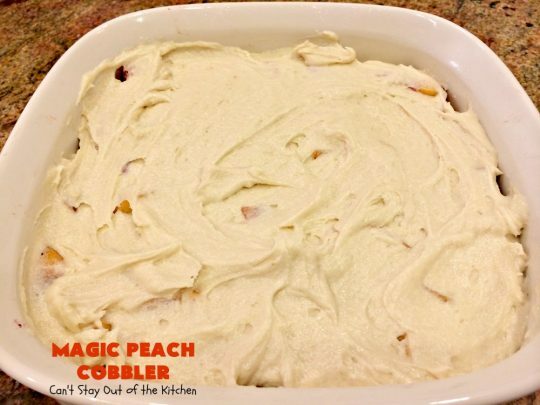 Serve Magic Peach Cobbler dolloped with whipping cream, non-dairy whipped topping or ice cream. 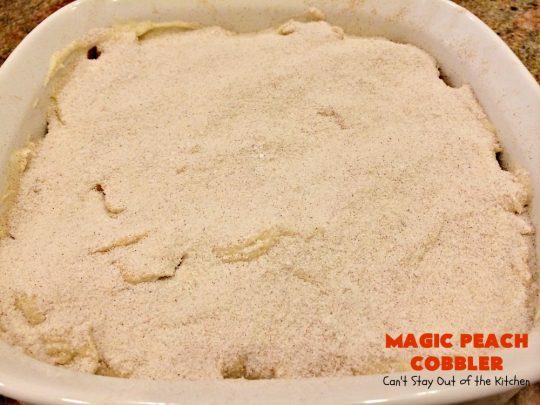 Or you can serve Magic Peach Cobbler plain. This dessert is so delectable you won’t be able to stop eating it no matter which way you serve it. 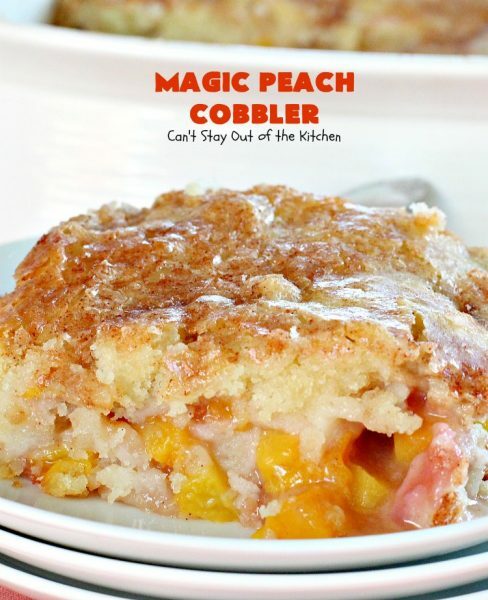 This spectacular cobbler is filled with peaches but it's the topping that's magical. Boiling water is poured over the crust and cinnamon-sugar mixture on top. As it bakes something magical happens and the topping hardens somewhat. Absolutely sensational Peach Cobbler. Arrange peaches in the bottom of prepared baking dish. 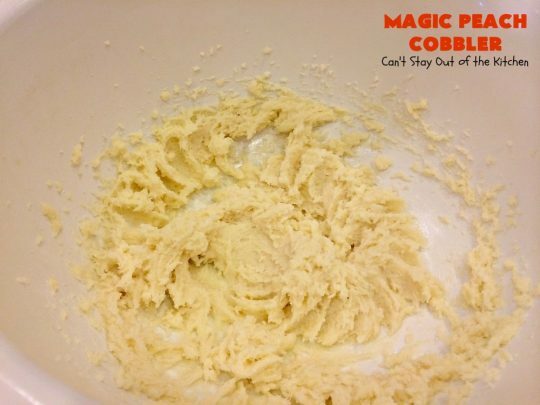 Cream 3/4 cup sugar, butter and vanilla in a mixing bowl with an electric mixer until smooth. Add milk, flour, salt and baking powder and continue mixing with mixer until creamy. 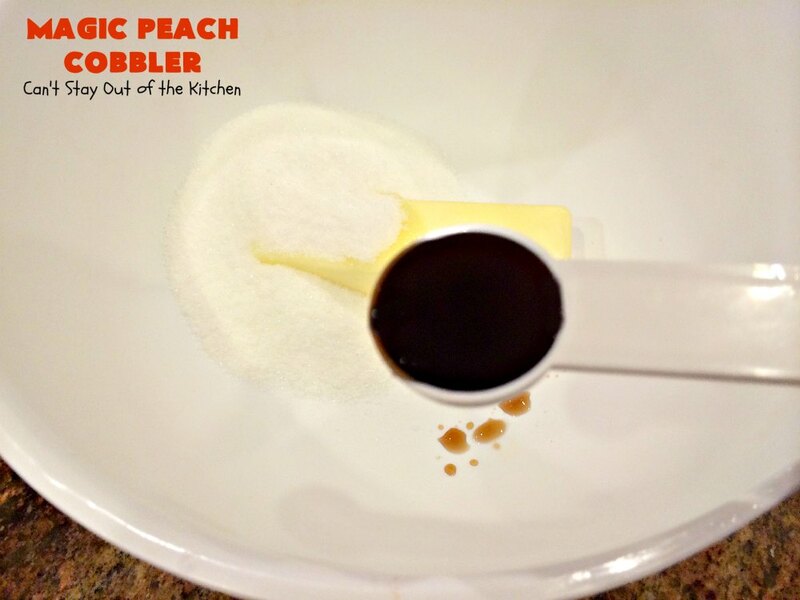 Spread batter evenly over the peaches in baking dish. In a small bowl, combine1/3 cup sugar, cinnamon and cornstarch. NOTE: Canned peaches can be substituted. Pat dry before putting in prepared baking dish. Recipe adapted from Mommy's Kitchen. 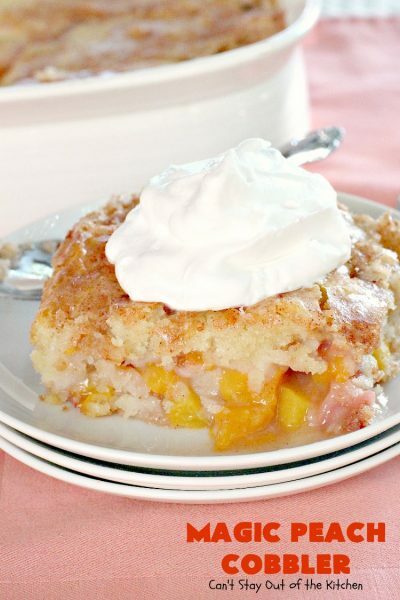 This spectacular cobbler is filled with peaches but it’s the topping that’s magical. Boiling water is poured over the crust and cinnamon-sugar mixture on top. As it bakes something magical happens and the topping hardens somewhat. 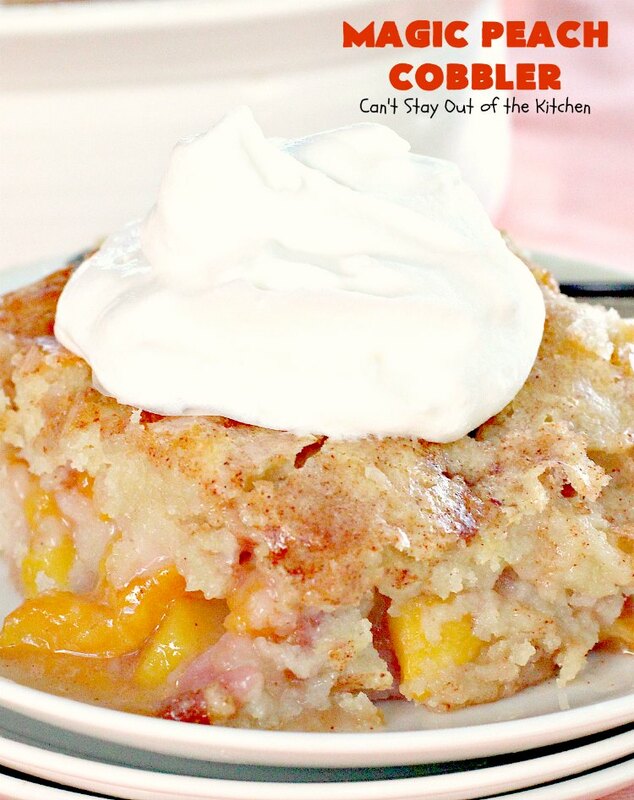 Absolutely sensational Peach Cobbler. Spray a 9×9” glass baking dish with cooking spray. Canned peaches can be substituted. Pat dry before putting in prepared baking dish. 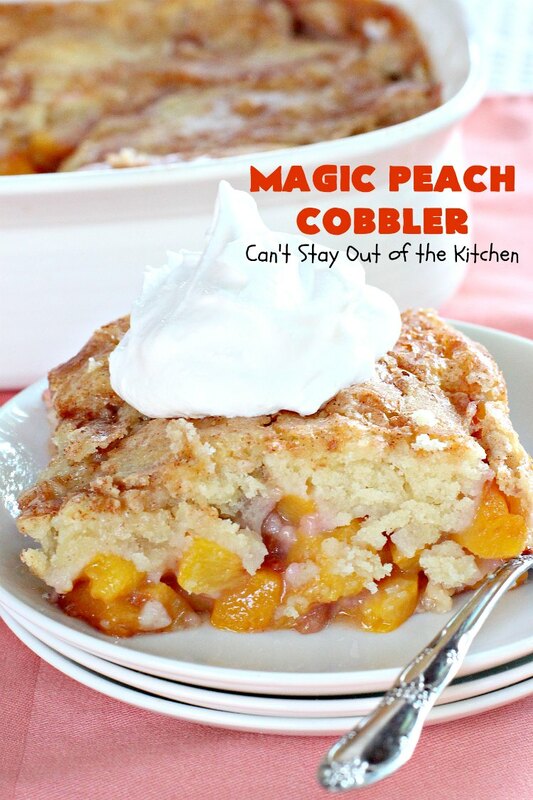 If you love peaches you will love Magic Peach Cobbler. 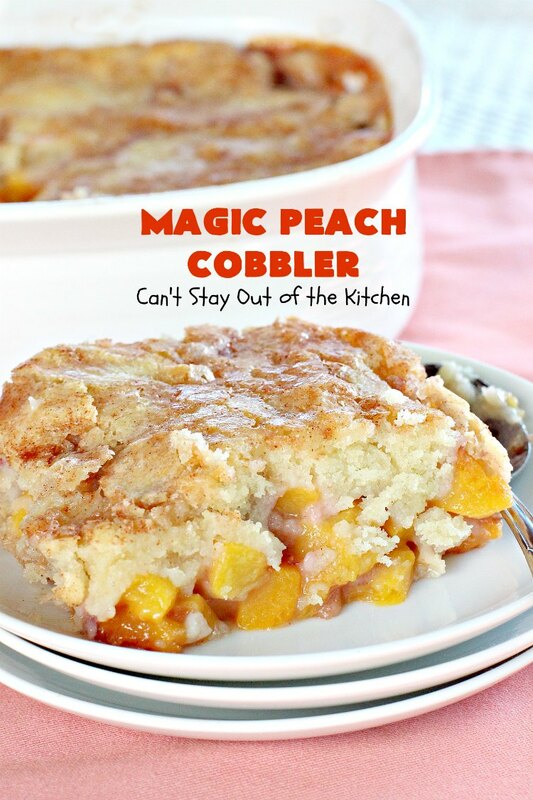 Doesn’t Magic Peach Cobbler look amazing? Could I make this the night before and just warm up to serve the day of? Hi, Alyssa. Absolutely. This is one of my favorite peach cobbler recipes. It just turns out awesome. I would probably tent the cobbler with foil to warm up so the crust doesn’t get too brown. I just wanted to thank you for this recipe. I made it this morning and it is going to be a staple. Can u use the batter with any fruit ? Blueberries apples? Hey, Cher. I just made it last week with cherries. It was phenomenal. I skipped the cinnamon and used almond extract instead. I think you can use the cinnamon with either blueberries or apples. I think it would be good with pears, pineapple, plums, strawberries – just about any kind of fruit. So glad you enjoyed the recipe. Yum!!!!!!! amazing but I forgot to add milk, you should try it! It is such an enjoyable recipe! One of our favorites for sure. Are the peaches too juicy if not tossed with a little flour or corn starch ? I tried the recipe today and yes, the peaches were way too juicy. 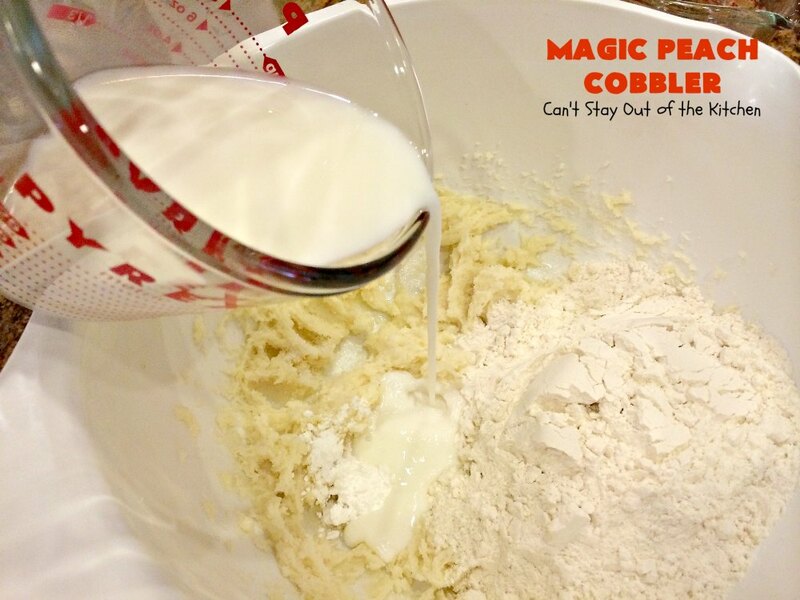 I’ll toss the peaches with cornstarch or flour next time. Loved the crust! Hey, Summer. Yeah, cornstarch or flour will help them thicken up. Glad you enjoyed it. 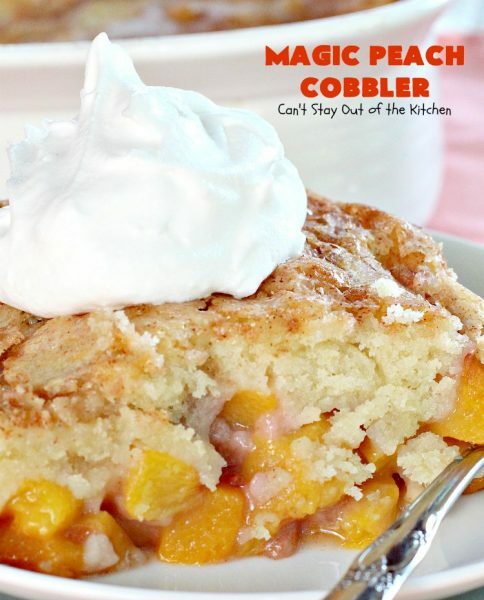 It was one of our favorite cobblers from last year’s peach season. Loved this recipe, going to make again tomorrow. I’m so glad you enjoyed the recipe John. I found it a superb recipe. You can also substitute other fruit if you like – strawberries, blueberries, anything in season and it makes those great too. Best cobbler honestly!! I’ve also done this exact recipe with strawberries and blueberries! Both were so good! Will use this from now on for any cobbler I make! Oh, I’m so glad you enjoyed it Katy. I really liked it too, among all the different recipes I tried last year to use up the peaches from the peaches in our backyard, this was certainly one of my faves. I love the idea of making it with other fruit, too. Got to try that this summer! 🙂 Thanks for letting me know. Hi, Sharon. I’m sure this would turn out scrumptious with blackberries or any other fruit. Enjoy. Thanks, Shauna. This turned out to be one of my favorite peach cobblers last year and I made about 10 different kinds! Can you used well drained canned? I would certainly try it, Cortney. I would probably sop up some of the moisture with paper towels, otherwise it may get too juicy and change the texture. But I don’t see why you couldn’t substitute canned or frozen peaches. Please let me know what you think. 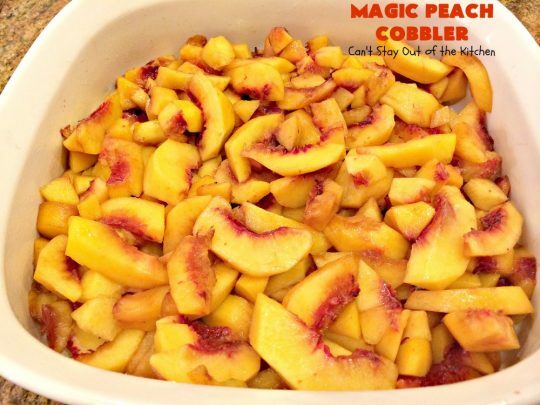 This was one of our favorite peach cobblers this past season – and I tried about 15 different kinds because we have peach trees in our back yard. This is magical! It would be devoured at our house in minutes! Thanks! I thought it was fantastic and I tried eight different peach cobbler recipes in July and August! Thanks for stopping by Julie. I love your blog. Can I substitute and fresh or frozen fruit I have on hand? Yes, Debbie, you can, but I would try to pat it dry really well before using so it doesn’t add too much extra moisture to the recipe. Thanks for stopping by. I hope you enjoy the cobbler!